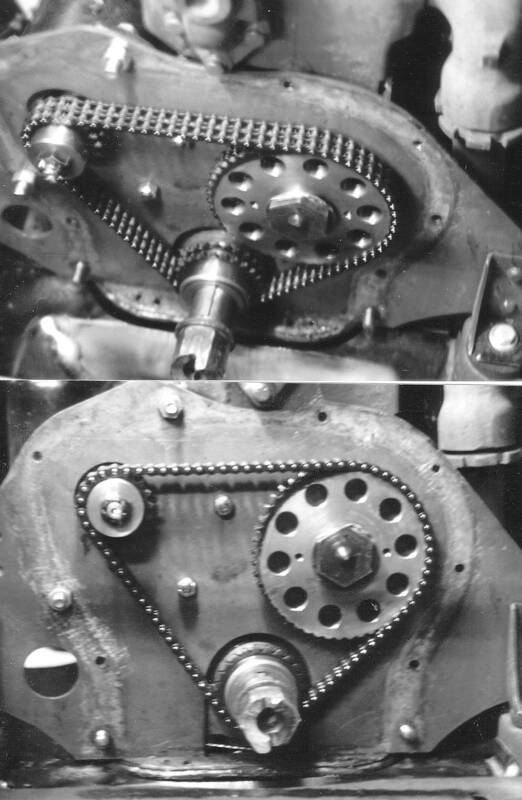 The following procedures I used to fit a set of Browning double roller sprockets and chain to my 1929 Durant 14L six cylinder engine. First you must purchase the sprockets and chain. These should be available at any good bearing supply company. 3. For the generator; one Browning sprocket P.N. D35B18 (18 tooth) These sprockets have harden teeth, do not substitute sprockets with non-harden teeth! 4. For the chain use Browning 35-2 RIV. 10 ft. CH, sorry guys this only comes in 10 foot lengths. Next you will need access to a good engine lathe or a good machine shop. Machine a set of soft jaws to a diameter slightly larger than the smallest sprocket; this will be the 18 tooth sprocket. Next, place '/4" by 3/4" long dowel pins, two per vice jaw, in the valleys of the teeth. This will be close to the pitch diameter of the sprocket and you will be running true to the pitch diameter. Now, bore the inside diameter of the sprocket to fit the shaft it mounts on, no more than .0005" clearance. While you have it in the chuck face of the hub to the length of the old sprocket. Machine the jaws to accept the next largest sprocket, 24 teeth, and repeat the above procedures. When done with that sprocket machine the jaws for the 48 tooth sprocket and bore and face it. Note; the cam shaft gear may rub on the bolt holding down the steel plate on the front of the engine. If this happens, you will need to relieve the back side of the cam sprocket or counter sink the bolt hole in the steel plate and use a flat headed screw in place of the standard bolt. O.K. almost done. Lets cut the key ways in the sprockets. IMPORTANT ! ! ! check the timing of the key on the respective old sprocket! Some key ways time on the tooth and others time in the valley between the teeth. Make sure you get the timing close or you will be making a lot of offset keys. This is only important on the crank and camshaft sprockets as the generator key way can be put where ever you like. I used a Minute Man broach to cut the key ways, but, any good method will work. Alright, let's mount these rascals. Slip the sprockets on their respective shafts, tooth side of the sprockets towards the engine. You want to keep the chain as close to the steel plate as possible. Tighten the nut on the shafts. With the camshaft in its running position come off of the face of the cam sprocket and check the alignment of the crank and generator sprockets. You want all three sprockets on the same plane so that the chain is running in a straight line parallel to the steel plate on the front of the engine. I had to place steel shims behind the crankshaft and generator sprockets to get this right. If all this sounds confusing, a journeyman machinist should have no problem helping you figure it out. Remember it's only nuts and bolts.